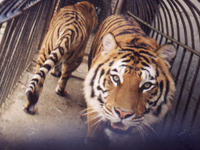 Animal Defenders International : Animals in entertainment : Will UK Government finally ban wild animal circuses? Animal Defenders International (ADI) has welcomed reports today that a ban on the use of wild animals in circuses in England is finally to be progressed by the UK Government. If true, it signifies an end to years of inaction and more than a decade of promises by successive governments, during which ADI has time and again exposed animal suffering. In England, urge your MP to support the ban. In Wales, keep the pressure on the government to do the right thing - contact your AM now. In Northern Ireland, please urge your MLA to support a ban. Outside of the UK, join the global campaign to Stop Circus Suffering! Donate towards ADI’s work for animals.